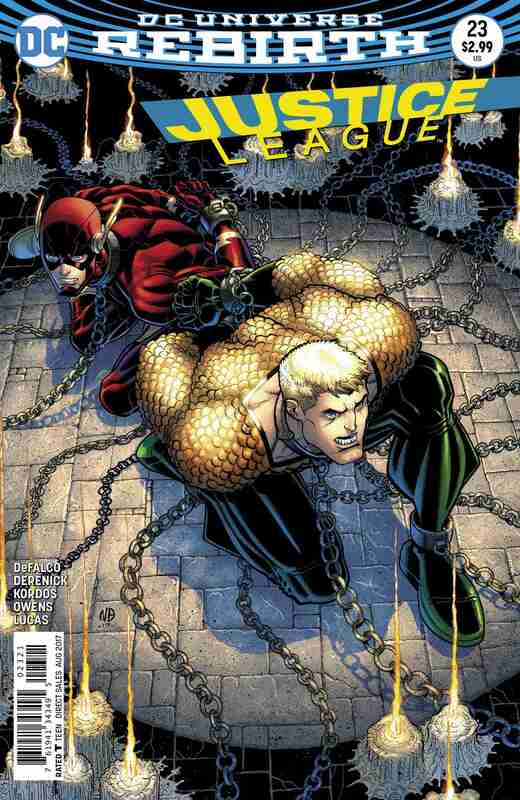 Sadly, much like the rest of the series, Justice League #23 is uninspiring and bland. Save your money and purchase better books this week. To say Justice League has been lukewarm over the past year would be the kind way of saying it hasn’t lived up to its usual standards. As sad as it is to admit, it’s a one hundred-percent accurate assessment. However, with all the recent changes in creative teams, one would hope that it’s the catalyst the series needs to get back on track. 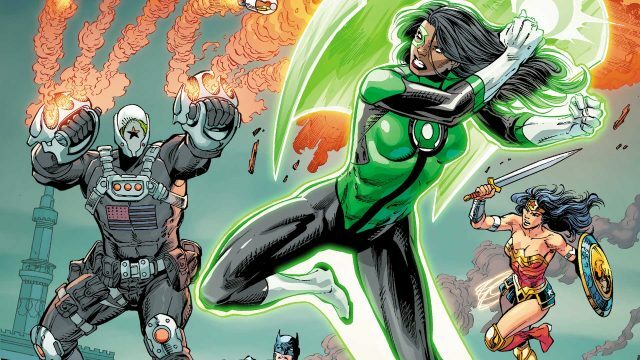 Does Justice League #23 deliver, though? 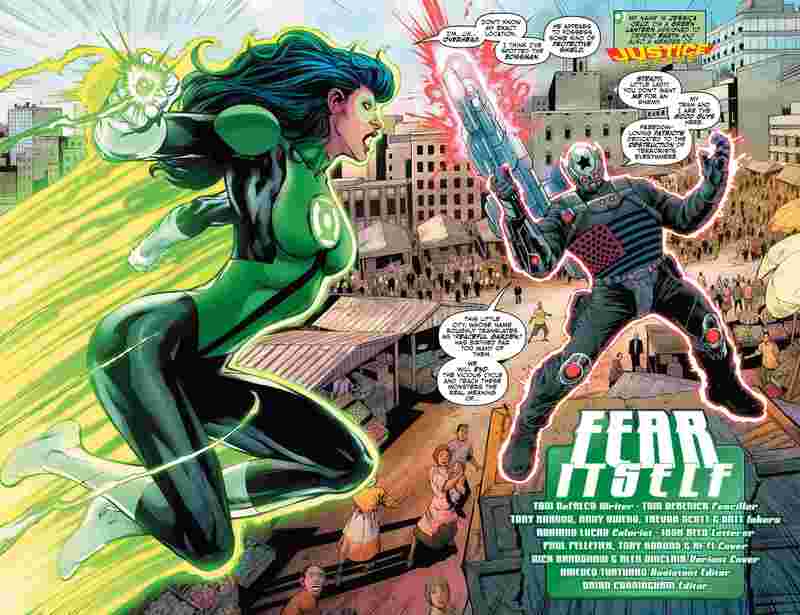 In this one-shot issue titled “Fear Itself,” Batman, Wonder Woman and Green Lantern Jessica Cruz take on an extremist anti-terror group led by Black Shield. You can imagine how it could become a tale about how the League isn’t actually making the world safe from terrorism by stopping the military team. Yet, this isn’t the main focus here, as the storyline becomes all about Jessica and her dealing with fear. And this is where the issue derails itself. 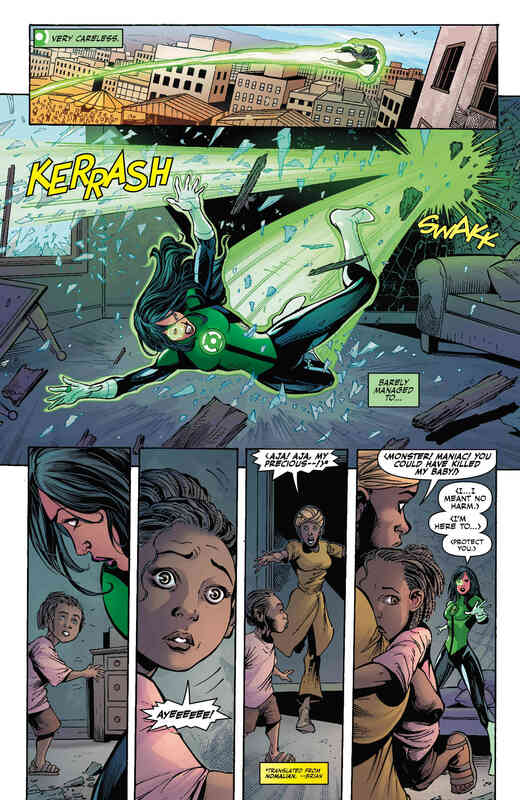 For anyone who’s been reading Justice League for the past year, you’re undoubtedly aware of Jessica and how out of place she feels, constantly questioning her place on the team and being in awe of the other heroes. While it was endearing at first, it’s become annoying now. Surely, after 3 issues with the group, she shouldn’t be overwhelmed by the whole occasion every couple of pages, right? Frankly, it’s sloppy writing and editing by keeping her as the directionless puppy of the team. She’s a relative newbie, yes, but her reactions have become akin to the “oh my” in the Fifty Shades trilogy: overused and tedious. Where’s the character development? Tom DeFalco’s story itself is okay. It’s not bad, but it’s far from sensational. As mentioned above, the premise of the anti-terrorist group could’ve led to an interesting angle and debate, but it became Jessica instead. Also, we’ve yet to see the Justice League take on a formidable opponent in Rebirth and the trend continues here with Black Shield and his goons. 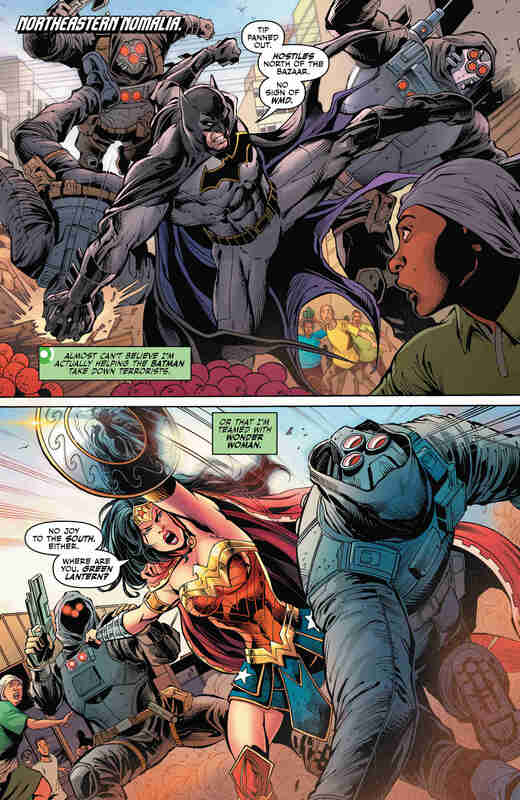 When you put together DC’s greatest heroes, you expect them to do battle against the mightiest villains – not some two-bit thugs. Sure, the threats and stakes remain high, but the antagonists aren’t convincing enough. Tom Derenick takes hold of the pencils here, and I must admit that I’m left uninspired by his efforts. It’s reminiscent of the early stages of Rebirth where the artwork appears rushed, rough and unfinished. The characters’ faces change facial structure from panel to panel and the whole process looks sloppy from beginning to end. When you consider the quality of the artwork in Batman, Nightwing or Superman and then come to back to this, you can’t help but feel cheated. 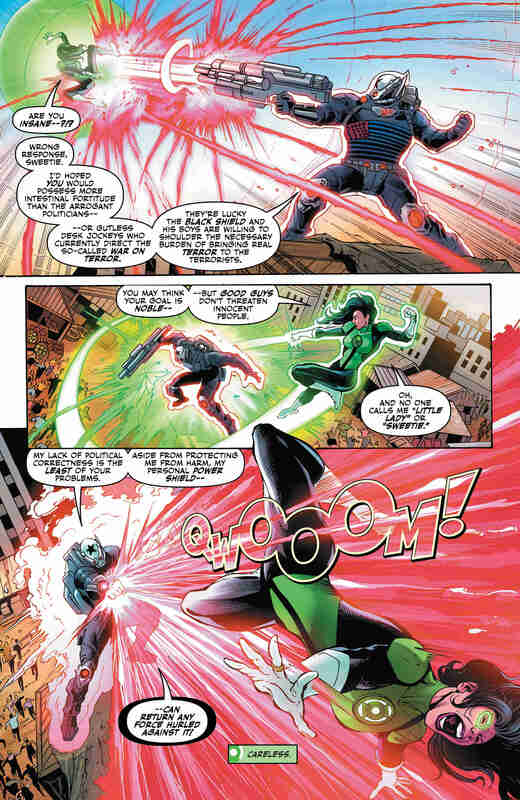 Unfortunately, much like the rest of this series so far, Justice League #23 doesn’t do much to stand out from the pack. There’s a severe need for an injection of fresh creativity in this title as the stories continue to be bland. 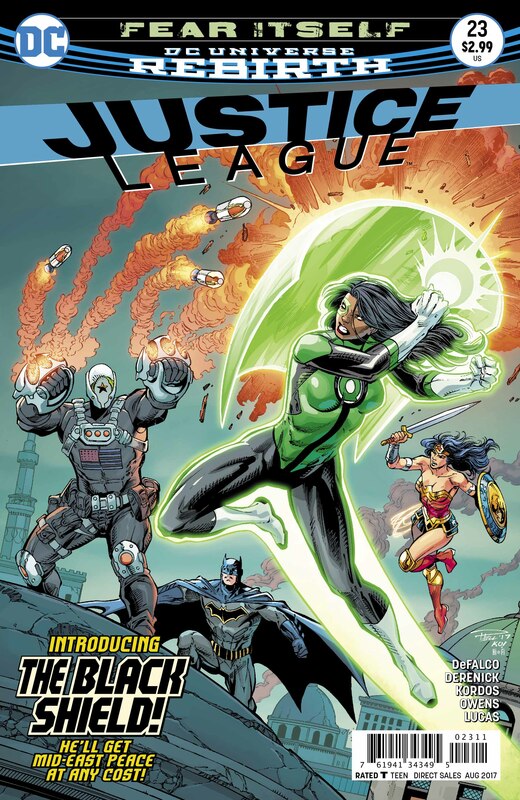 It’s a flagship book for DC, so we really expect much more from it. Quite frankly, this is simply not good enough.